The Oro Loma Sanitary District serves San Lorenzo, Ashland, Cherryland, Fairview, and parts of San Leandro and Hayward. The Oro Loma Sanitary District had previously “opted out” of the ACWMA Mandatory Recycling Ordinance 2012-01 for the parts of the District that do not fall in San Leandro or Hayward, but are now opted in as of January 1, 2017. Provide containers and service of sufficient number, size and frequency for recyclable materials. Businesses and institutions that generate significant quantities* of organics (food scraps and/or compostable paper), such as restaurants and grocery stores: Provide containers and service of sufficient number, size and frequency for organics. Recycle all recyclable Covered Materials: cardboard, newspaper, white paper, mixed recyclable paper, recyclable glass food and beverage containers, metal (aluminum and steel) food and beverage containers, PET (#1) and HDPE (#2) plastic bottles. Businesses and institutions that generate significant quantities* of organics, such as restaurants and grocery stores: Place food scraps and compostable paper in separate organics cart/bin for organics collection. Ensure recycling and organics containers are contamination free. Only recyclable materials may be placed in recycling containers and only organics may be placed in organics containers. Provide information at least annually to employees, tenants, and contractors describing how to properly use the recycling, garbage, and organics containers, as well as no later than 14 days after move-in and no less than 14 days prior to move-out of tenant businesses. 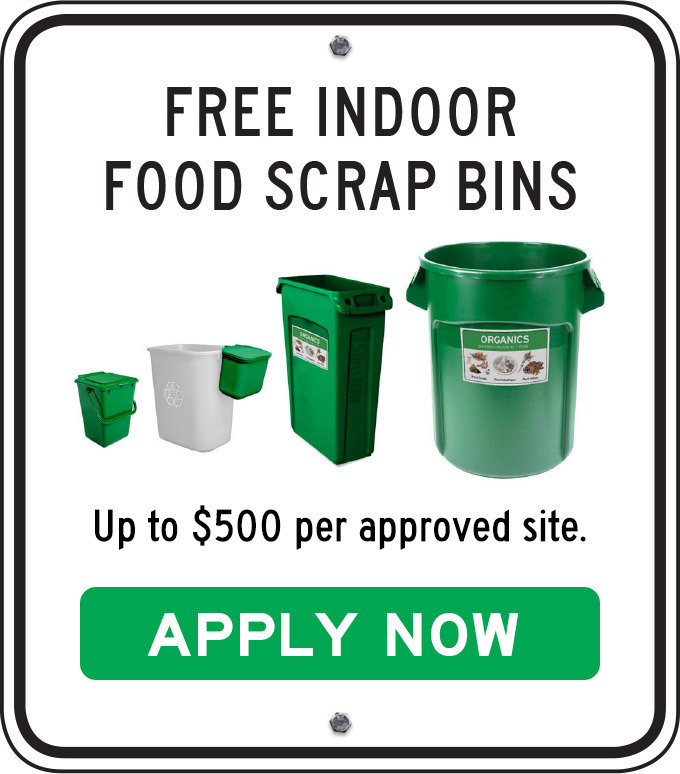 * The Ordinance prohibits the disposal of any food scraps or compostable paper in the garbage. However, for practical use, organics are considered to be “significant” when 10 or more gallons (think two 5-gallon buckets full) are disposed of in a garbage cart or 20 or more gallons (four 5-gallon buckets full) of organics are disposed of in a garbage bin. Additionally, ACWMA Ordinance 2008-01 requires businesses and institutions in Alameda County generating 4 or more cubic yards of garbage per week to separate all plant debris from garbage and recyclable materials. Those with on-site service must place plant debris in a designated organics collection bin. Businesses can arrange for the removal of plant debris by their landscaper. The landscaper must haul to an approved facility and must deposit plant debris in the facility’s designated “clean green” area. Provide containers and service of sufficient number, size and frequency for recyclable materials at the same or at an equally convenient location as garbage. Provide containers and service of sufficient number, size and frequency for organics (food scraps and compostable paper) at the same or at an equally convenient location as garbage. Provide information at least annually to employees, tenants, and contractors describing how to properly use the recycling, garbage, and organics containers, as well as no later than 14 days after move-in and no less than 14 days prior to move-out. Additionally, ACWMA Ordinance 2008-01 requires multi-family properties in Alameda County generating 4 or more cubic yards of garbage per week to separate all plant debris from garbage and recyclable materials. Those with on-site service must place plant debris in a designated organics collection bin. Multi-family property owners or managers can arrange for the removal of plant debris by their landscaper. The landscaper must haul to an approved facility and must deposit plant debris in the facility’s designated “clean green” area. The Oro Loma Sanitary District contracts with Waste Management of Alameda County for garbage, recycling and organics (food scraps, food-soiled paper and plant debris) collection service. Waste Management provides free onsite waste and recycling assessments upon request. Properties located in parts of San Leandro are in the service area of the Oro Loma Sanitary District and others are located in the service area of the City of San Leandro. If you are unsure which service area you are in, check your garbage bill. If the vendor is Waste Management of Alameda County, you are in the Oro Loma Sanitary District. If the vendor is Alameda County Industries (ACI), you are in the service area of the City of San Leandro. Below are downloadable support materials specific to the Oro Loma Sanitary District service area. Additional support materials for any community are also available for businesses and institutions and multi-family properties.